Pulp and paper mills need to effectively manage water in order to be successful. The Geotube® solution can achieve this in a manner that is likely more cost effective than what is currently being used, and also in a way that meets environmental concerns. Works with fine grained sediments. 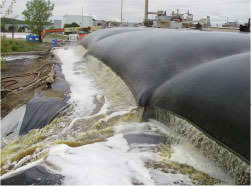 Effluent can often be discharged without additional treatment. Ideal for continuous operations, mill waste streams and clarifier underflow. Adds capacity without increased capital, energy, maintenance or manpower. Cleans tank, pond or lagoon waste areas. 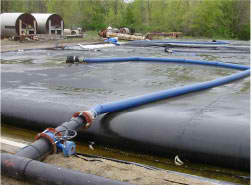 Geotube® dewatering technology has been used for lagoon cleanout, dewatering of process waste and even environmental contamination. For some facilities, the Geotube® solution is a temporary process; for others, it is a regular part of their operations. The flexibility of the Geotube®; solution allows for both options. 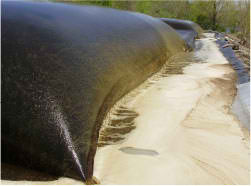 The technology in the Geotube® dewatering process has proven to yield extremely good results. In some cases, material has reached solid levels of more than 45%.